It’s a universal experience: we eat when we’re bored, or lonely, or excited… for a multitude of different reasons that sometimes do not include hunger. But our psychological reactions to this experience can vary greatly. For some, it becomes a cycle, a burden. Some will binge eat then panic when the sick feeling sets in, taking drastic measures to reverse the damage they have just inflicted on themselves. Bulimia is a very real and common problem, affecting (millions) of men, women and children of all ages. Bulimia nervosa is an eating disorder characterized by regular episodes of binge eating, followed by frantic efforts to avoid gaining weight. Bulimia is a significant public-health problem, both because of the physical and mental health effects it can have. This illness often co-occurs with body dysmorphic disorder, depression, anxiety, and substance-abuse disorders. To be bulimic means you are locked in to a constant struggle between binge eating and an intense desire to try and avoid gaining weight. Those who suffer from it are aware of what they are doing and know the consequences, feeling sick, guilty and ashamed-but feel powerless to stop themselves, as if it is beyond their control. Typically, a binge tends to mean you will consume between 3,000 to 5,000 calories within an hour. Upon the completion of the binge, the inevitable panic will set it and sufferers will take drastic measures in an attempt to “undo” the binge. Methods may include self-induced vomiting, taking laxatives or extreme exercise. Bulimia can cause gum disease, osteoporosis, kidney disease, heart disease, and even death. Because binge eating and purging are practiced in secret, the incidence of the disorder is uncertain, but researchers estimate that as many as one in five of all U.S. women in high school and college display at least temporary bulimic symptoms. Adolescents are most at risk for developing bulimia, as statistics show that about three-quarters of people who develop the illness do so before they reach 22 years of age, most often at 15 to 16 years of age. About 1%-2% of adolescent girls in the United States develop the disease. Though it is most common with caucasian females, bulimia knows no gender or race. Numbers indicate that boys and African-Americans suffering from bulimia is on the rise. While it is true that roughly only about 45% of people with bulimia fully recover, the likeliness of that recovery is far greater with treatment. This can include therapy, a strict diet, and time in a residential treatment facility. These types of programs will remove the sufferer from their day to day surroundings in an attempt to “reprogram” their eating habits and get to the root cause of their disease. These programs take place in environments that are specifically set up to treat the sufferer and will last for varying periods of time. • Has a biological parent, brother, or sister who has an eating disorder or who is overweight or obese. • Is overly concerned with weight or struggles with symptoms of depression. • Is overweight and is starting a restrictive diet. • Has certain personal traits such as perfectionism. • Struggles with cultural and social factors such as admiring thinness. If you believe that you or someone you know suffers from this disorder, there are resources available to help. Shades of Hope is one such resource, we offer a wide array of programs both short and long term. 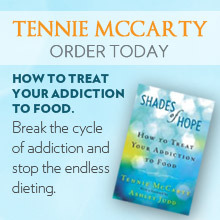 Visit our website at www.shadesofhope.com or call 1-800-588-HOPE.